Leo (The Lion) enters stage east in March. 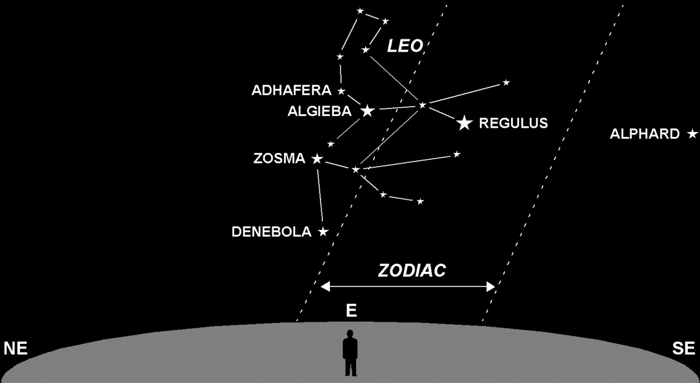 Leo is one of the brightest of the twelve zodiacal constellations. The Zodiac is a 16° wide band stretching 360° around the sky — we can only see 180° of it at any given time since the Earth below our feet blocks the other half from view. The Zodiac is home to the planets and Sun, all of which can be found somewhere within its celestial boundaries. The Moon hangs out there a lot too. And, yes, these are the same twelve constellations used in astrological horoscopes. Just ahead of Leo is Cancer (The Crab). Following Leo is Virgo (The Virgin). The gradual motions of the Sun, Moon and planets through these constellations provides astrologers the fodder for their predictions. Positional combinations, they claim, give rise to mystic interpretations. For example, if your “sign” is Leo, the Sun was in Leo on the day you were born. If Venus (symbolic of love) and Mars (symbolic of conflict) are both currently in Leo, your horoscope may predict a downturn in your love life. My advice is to ignore these dire warnings. Take your relationship outdoors, turn out the lights, and let the stars get in your eyes.